Yes, I really can see another continent from my house! This entry was tagged Africa, Andalucía, East of Malaga, Europe, lifestyle, Malaga, photography, Post a week, sunset, travel, Travel theme, weekly image of life, Weekly Photo challenge. Bookmark the permalink. Yes, it is, isn´t it? OK – well that´s a deal then! I´ll post it soon. I grew up in a massive province in Canada. One can drive for 14 hours straight and not cover the entire distance. When I moved to the east coast, I was stunned when one trip to the sea resulted in my being able to spot another province from the beach (PEI). I imagine that the same surreal feeling I had then, would be similar to what you experienced (but multiplied by 1000). I can´t imagine living so far from the sea, Dave. I´ve lived in a coastal area all my life, both back in the UK and now here in southern Spain. I love to see the sea and to walk on the beach or within sight of the water. Stunning … art for the eyes. Spectacular shot of it. Thanks, Isadora. 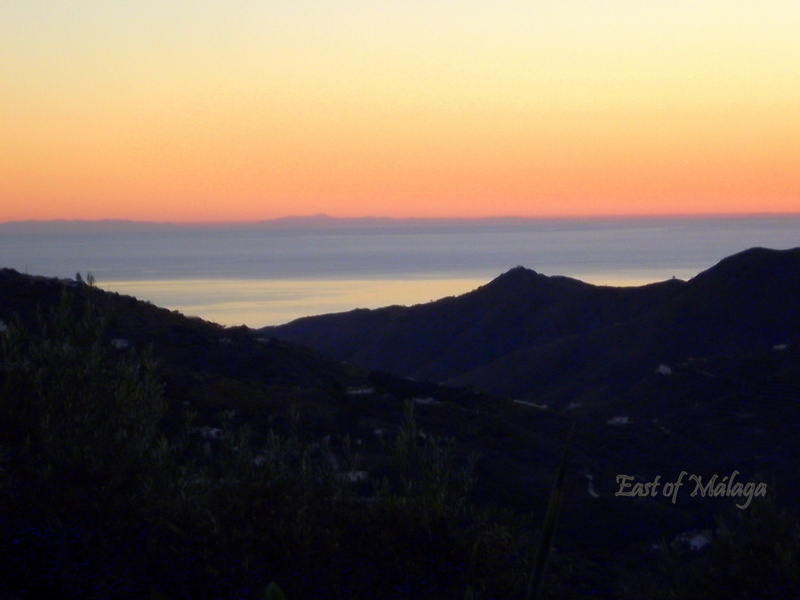 The Rif mountains are about 150 miles away, across the Mediterranean Sea – so this is a sight we only see a few times each year, when the atmospheric conditions are perfect. The few times would be of great satisfaction for me. To be able to see the glorious creation before me would be breathtaking. Enjoy …. It is indeed! It´s pretty hot here in Andalucía as well, at the moment. Wow, what an incredible view! Still – it IS pretty impressive and doesn´t happen in many places in the world. I´m lucky, but I know it. I guess seeing my kid’s bike from the terrace isn’t near as impressive as seeing a continent. omg I used to live in africa! then on islands off the coast of them, and its awesome to see other continets and islands from one shore to another. makes the world feel small though!!! Hehe and that smidgen on the mountain jumping up and down, waving like crazy – well, that’s not me cause I’m on the Southern end of Africa waving and jumping at that end 🙂 Thanks for sharing the lovely photos. But of course – friendliness makes the world go round. The world is such a beautiful place. The more I travel the more I know that to be true. Wow, not many people have that view! Beautiful! On a clear day, just around the corner, we can see Corsica. Thanks Ruth – I never take it for granted. Ever. I remember once many years ago I was hitching from Almeria to Granada and sleeping rough and woke up to see Africa in the distance. I cant remember where we were but we argued whether it was Africa or not and when we asked…yep it was Africa.Amazing! Lucky you! Wow, not many people could say (or prove!) that! I´ve been across to Morocco, so I know what it´s like, but I wonder how many people can see it there, tantalizingly close, yet never have the urge/opportunity/means to go? Unusual, isn´t it? I absolutely love it, Jo! Beautiful! And how wonderful for you! Thanks – though I must admit it came as a surprise when a neighbour first pointed it out to me! WOW! Now that’s a gorgeous view! I never fail to be excited when I can see it, Meg. It certainly doesn´t happen every day. It´s usually evening time, around sunset, and maybe eight to ten times a year.